Run any of your FME Desktop workflows consecutively or in parallel by publishing your workspace to FME Server. Set up schedules, create an Automation, or build a self-serve portal, so your data is integrated exactly how you need. FME Server’s web user interface allows users to control their data with ease. 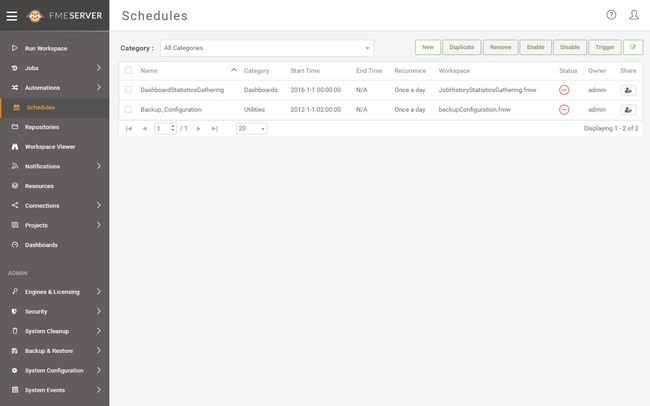 Organize related items in a single location, review your workspaces, or adjust how and when notifications are sent. By customizing FME Server functionalities to be specific to your organization, you can rest easy knowing your data will be where you need it, when you need it. Automatically process your data in real-time by defining events that trigger your data integration workflow by using Automations. Watch a directory, email address, or web service and run the workflow(s) of your choice when an event occurs. By identifying specific triggers, actions, and reactions, new data uploads or data requests can be made instantaneously without the need for any manual interaction by the author. 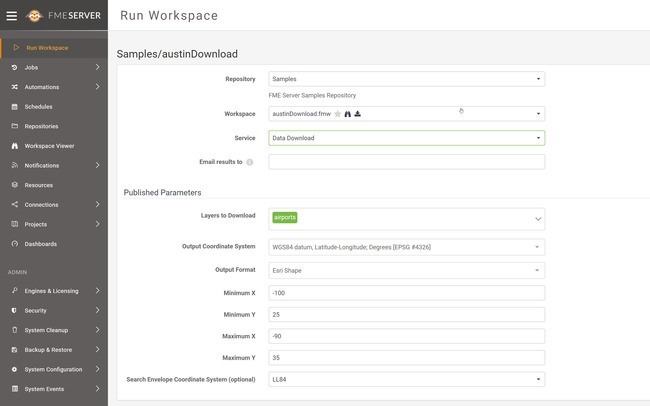 Run your FME Desktop data integration workflows at any time of day without having to lift a finger. Define which workflow or set of workflows you want to run on a single or recurring schedule. After your data is successfully integrated, send yourself and your team an alert to let them know. Your configured notifications can alert you of successful runs, errors, or failures. Data accessibility among co-workers, contractors, or even the public doesn’t need to be difficult. Maintain control and security by creating self-serve access to data that allow others to upload and download data with ease. Been a while since you last opened your FME Desktop workspace? Re-visit what you or others have created directly within FME Server without having to touch FME Desktop at all. With FME Server, catching up is only a few clicks away. Power the flow of data across the enterprise, from simple cloud services to complex legacy systems. 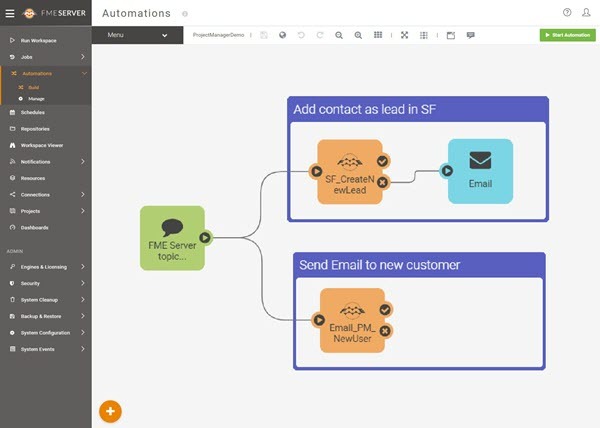 FME Server includes a REST API and supports common protocols such as email, WebSockets, JMS, and more. This all in addition to native support for hundreds of file formats and applications. Included with FME Server is a powerful REST API that gives you control over a wide range of FME Server functionality. Manage user accounts and other settings to ensure FME Server is tailored to your needs. Whether you're a small local shop or a large multinational organization, FME Server can meet your automation needs. And as you grow, FME Server can seamlessly scale up with additional engines. Rest assured, your data will always be safe and sound with FME Server’s fault tolerant architecture. On top of the built-in component and translation recovery, the easily configurable architecture can be adapted for high availability and capacity. Finally, a powerful tool that's also fun to use. FME Server’s web user interface is highly intuitive and easy to use. Navigating the options for how to control your data is a breeze. Before you know it, you’ll have everything ready to go. FME Server is hosted on premises, securely behind your firewall. 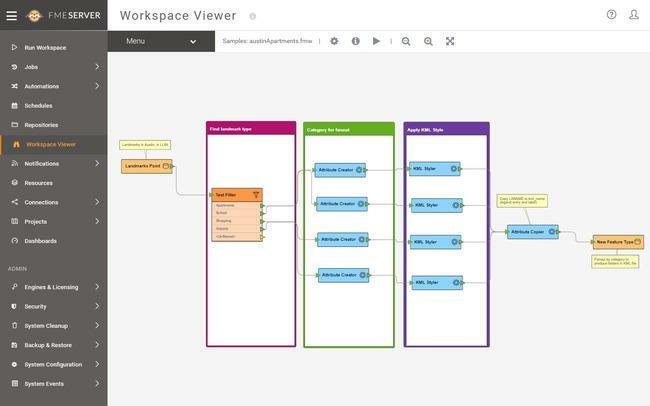 If you want to take advantage of the scalable nature of the cloud, you can easily migrate your workflows to FME Cloud, the hosted version of FME Server. FME mobile applications are available (for free!) to help you and your team do more. These mobile apps can be used by anyone, no matter the technical skill or FME expertise. For example, FME Data Express is connected to your FME Server to allows a user to collect data, images, or location information and run it through a workspace on the spot. This means data is integrated and moved to the exact place it needs to be before anyone even returns to the office. "FME does all my work for me while I sleep at night. It’s absolutely a life saver." "I love FME because it just makes my job easier every day." "FME Server has made automating data submission and validation at York Region a reality." "FME Server allowed us to offload processing from our Oracle databases and expedited our public map rollout by avoiding developing code to do the same job." "We had a really tight time constraint. We didn’t have time to go through training and read all the documentation. That the REST API was so well built with FME Server really helped us because it was so sane." To learn more about all FME tech specs, visit the technical specifications page. Browse a library containing demos of popular use cases for FME Server. Download a free, fully functional 60-day trial of FME Server.